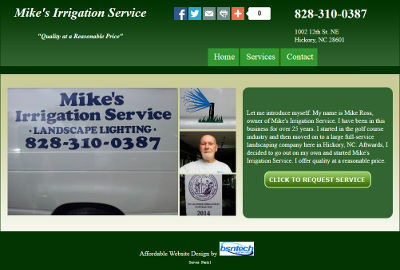 Mike, the owner of Mike’s Irrigation Service, contacted us last week in order to create a website. He seen two other sites we created which looked very close and wanted to have a website identical to it – except with his own pictures and information. Mike sent in the initial amount to get started on his website, which we received yesterday. He also included the text information with the payment. We got started right away on the site – getting his domain name registered and the web hosting setup. Once he received the Confirmation e-mail from us, he then forwarded us the pictures he wanted on the site. Within less than 24 hours, we had his website fully setup and running. He was very happy with the fast responsiveness to his e-mails and the fact that we got his website up very quickly. Thank you for your business, Mike, and I hope we receive some referrals from you for other website design customers! The website for Mike’s Irrigation is at mikesirrigation.com.